Kick your “pile it and file it (later)” attitude before spring cleaning season has you thinking about organizing your garage. I’m talking about getting your tax prep habits geared toward a more sustainable system. A well-organized tax prep system could save you big money if your accountant charges by the hour to go through your big, messy envelope of receipts that are out of order and half rubbed out. Though the April 30 filing deadline may be months away, your company should be thinking about ways to make that period as smooth as possible. It might seem old school, but I’ve got the solution to your tax organization woes. If you’re over 35, it’s probably the system you got from your parents; taught by watching them rifle through their little paper folder systems, eyes shifting from one homemade label to the next to find those darn receipts. This technique may sound like “bookkeeping for dummies,” but you’d be shocked at how many people get toasted on their taxes because they didn’t keep their receipts in order and therefore didn’t get to deduce everything they should have. Save yourself from the madness of sorting through messy drawers and boxes jammed with paperwork. Here’s the best way I know of keeping receipts in a visually organized, hard copy form, where they are easy for your accountant to understand. Receipts for everyday purchases and subscriptions. Big purchase receipts, like technology, enterprise-level software, education or office furniture. File here your receipts for everything from car repairs and leases to rent or property purchases. Receipts that back up deductions for this year’s taxes. If you make quite a few small purchases throughout the year, create a small envelope for each month and file them that way within this folder. Always make notes on your receipts to indicate what the expense was for and if it pertains to the general business operations, a job number or a particular client. Collect receipts for business expenses in your folders as soon as you get them. Use an envelope in your car glove box to collect receipts you receive on the road, and remember to file those away every time the envelope starts to fill up. 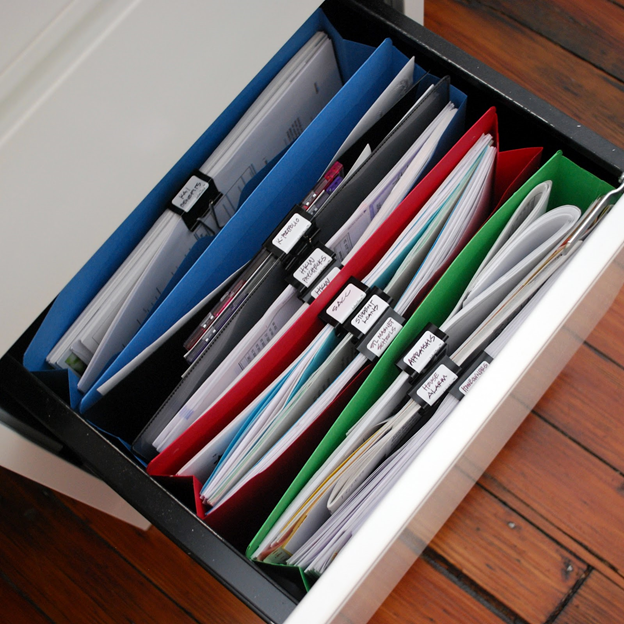 Have a folder for each month at a bare minimum, or sort them into folders for each kind of expense. It’s imperative that you keep all receipts for your credit card together and attach them monthly to the credit card statement. TIP: Keep your personal and business banking separate. The CRA could come down on you with a lot of questions if they see personal stuff on your business account. The same thing goes for your business credit cards. While the folder technique is the way to manage hard copies of receipts, I also recommend picking up a way to save digital copies of the receipts too. Use a scanner or take photos of the receipts with your smartphone. There are 1,000 ways to do it and zero excuses to not having backups of your important tax-related receipts. Do keep your digital receipts in the “Cloud” or on an external drive in case your computer breaks down or gets stolen. Finally,I can’t stress how important it is to hire a bookkeeper with experience. A student may know a few things, but theywon’t have the hands-on experience a small business needs—no matter how organized your receipts are. Anyone can enter things into software, but there must be a thorough knowledge of the tax system present as well. Maybe you can ask your bookkeeper what organization system they swear by and adopt that—I bet it has something to do with paper folders and neat little labels, too. Ask me to name one of the most frustrating things I see on a quarterly basis, and my answer would be: waste. Waste is a prominent problem, so may think that I’m talking about wasteful spending, but there’s another big way Canadians are leaving cash on the table—losing out on opportunities to claim more on their taxes. Here’s a dilemma I face on a daily basis: when to open my mouth when I see someone wasting their time or money on an accounting process that does not reap them all the benefits it should. I want to scream, “What about all the missed deductions you’re not taking advantage of? !” It’s like watching someone race through a video game to get to the end without ever collecting any coins or bonus lives along the way. These deductions are there to help you and your small business. Sure, they may be hard to navigate or catch them all, but that’s why you need a professional accountant on your side. I say, it’s time for small business owners to stake their claim, especially when they are using their home as a workspace. The first step, in my opinion, is always to get an accountant who is sensitive to the laws around home business claims. But as you prepare for any tax season, keep in mind some of the most common expenses home-based business fail to claim and remember the only way to maximize your deductibles is to keep those receipts! If you carry any business insurance, including buildings, machinery, and equipment, pay attention. Deductible insurance includes malpractice insurance or other business insurance—vehicle, product liability, professional liability—you may purchase. For more on the kinds of insurance that can be claimed by Canadian companies, the Line 8690 page of the CRA website is helpful. Any trade specific publications you receive on a monthly, quarterly or annual basis, can be considered deductions. Just make sure that they are unique to your business and can’t be general publications. Like those publications, if you belong to any professional organizations, you can deduct your membership fees and dues provided they qualify. Union fees and licensing boards count! Are you the lower income spouse in a household that pays for child care costs? Then you can claim $11,000 for each child born in 2015 or earlier and $8,000 for each child born in 2009 or later. Those expenses include babysitter or nanny fees, daycare costs, and after school program (PLASP) fees. And, did you know that 2016 is your last year to claim your Children’s Fitness Amount? That’s the tax credit of 15% you can get back from a physical activity program for the kids. You can claim up to $500 if your child is under 16 and their program qualifies for the children’s fitness tax credit (check the receipt). Considering whether to lease or buy a car? If you think the difference tax reasons, see Toronto Accountant Discusses Leasing vs. Buying Car. As a Canadian taxpayer, you can also claim the Public Transit Tax Credit, for amounts spent on monthly or yearly public transit passes. Eligible passes include: This will end as of July 1st 2017. So do be aware of this. If you’re considering taking a course that is directly related to your present job—either at an accredited school or a place like Brainstation—and will expand on your skill set in the same industry, the tuition expenses are deductible. Do not deduct anything if you are taking something new to add to your business or to offer a different service. If your business includes outfitting yourself and your employees in uniforms or safety clothing, you can deduct the cost of all those items, plus the cost to have them cleaned. Unfortunately, this does not count the cost of dry-cleaning your day-to-day clothes—although that would be great, wouldn’t it? Have you or your spouse not claimed a charitable donation tax credit for the last five years? Make a contribution to your favorite charity this year and claim a deduction of 40% of your gifts of $200 and under and 54% of donations over $200 (without exceeding the maximum of $1000). This super credit is applicable exclusively between the years of 2013-2017, so you’re right in the sweet spot right now. For more information visit the CRA website to see how the super credit works. Of course, I don’t want you to forget to keep receipts for your office supplies, furniture, and tech items. Scan them and save them to a folder on your computer, or in the cloud, if you can. If you have any questions about what you can or cannot claim, contact me. I’ll help you find all those deductions you didn’t even know you could claim. Incorporating is not always a good option when you first start your business. We recommend incorporating once you reach 100k per owner in profit. The biggest reason not to incorporate is for tax reasons. When it comes to a lower income it is better to not incorporate. An unincorporated business is put on the owner(s) personal tax return. If the business is at a loss then this in turn lowers the household income. Which may or may not put you in a lower tax bracket. You can also claim part of your household expenses when you make a profit. We recommend when incorporating paying part of your home expenses but by having the corporation paying you rent. In turn this will have to be a reasonable amount and you will have to claim this on your tax return. A sole proprietorship or partnership is also easier to set up and takes less time and money to register. Doing a tax return for a sole proprietorship or partnership is also several hundred dollars cheaper, as it is done on your personal return. You will have to file only one tax return not two. Sometimes people may find it in their best interests to incorporate before they reach the 100k thresh hold. For example a client in the medical services profession has many people interested in becoming part of her business solely because of the name. So important is the name in the line of work she is in that many people from out of province and country are interested in it. Celebrities and sports people alike are searching for people when they come to town, and with a good name like the one she has it brings in lots of clients. To protect the name and her livelihood she decided to incorporate on the Federal level. When you do incorporate the corporation will be considered a separate entity and you won’t be personally responsible. At the time of this writing tax rates are lower for corporations. But with each new budget things can change. Also with corporations it may be easier to get loans. Some lending companies won’t lend out to a business that aren’t incorporated, or without assets. You can also sell shares in the corporation to raise money. Do keep in mind that the owners of the corporation are not allowed to collect EI should the business fail. So extra insurance for such a scenario may be warranted. Always put the owners on payroll. instead of Owners Draw. The government wants the taxes right away and considers it stealing from not only the government but from the corporation. Set up accounting software with your accountants help right away. Carefully choose your fiscal year start and end. Invest in some business insurance. Client was working out of province doing sub contract work. It is the same kind of work he does at home under his registered business. He was wondering if to put his income and expenses under his Corporate or Personal Tax Return. He stated that there wasn’t much profit if any. Here is my reply. If you charged the company you were doing sub contract work for GST/HST then you will have to claim all income and expenses under your business. There is no choice on this matter. If however you charged them GST/HST on only part of your sub contract work then you can divide up the income between your Corporate and Personal Tax Returns. By doing it this way you will also have to separate all of your expenses to match the dates for each pay period. It is important to remember that if you charged and collected GST, that the company you charged it to will be claiming it back. The government a few years ago hired more auditors to go over GST returns, as well as Corporate and Personal tax returns. This is one department in the government that does earn their keep. I have seen GST return audits in the past with not so good things happen to those that GST was paid out to. Some were collecting it without having registered for a GST number. Others that had not filed a GST return for years but were collecting it. So the government in turn knew these companies were active and wanted their money. If no profit was made and you didn’t take money your of your business or didn’t charge any GST to the company you worked for then claim it under your personal tax return. The loss can be carried forward to when you do make more money. If you did take money out of your business to pay for some of the expenses then this would be a draw and you will have to pay taxes on your draws. But this may be minimal if you didn’t make a profit. The government likes the taxes paid immediately on owners draws. As they consider this stealing from the Corporation and more importantly stealing from the CRA. This is why I recommend setting up payroll for the owner under a Corporation. The payroll taxes are paid monthly and a T4 is issued once a year. Very clean and simple.